Katjang Pino is a tasty peanut snack with gently roasted jumbo peanuts, wrapped in delicate, exotic spices. 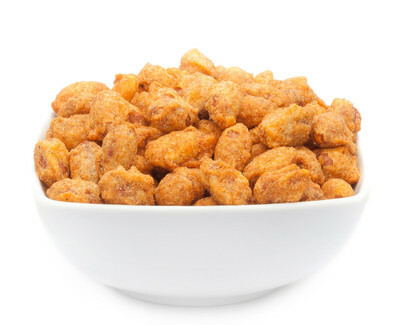 PEANUT, CORN, vegetable oil (SOY), salt, EGG, onion, sugar, spice, flavor enhancer: E621. May contain traces of GLUTEN and NUTS. Of the good taste and the best ingredients, you can't ever get enough. The delicious crunchy shell of our Katjang PINO has the taste so convinced that we have chosen as a basis for this special nuts snack Jumbo, peanuts in this superb blend of spices, so the taste buds get can't get enough. Our gently roasted jumbo peanuts are of premium quality and develop their fine aroma especially well in combination with the paste from selected especially for this snack with exotic spices, and give our peanuts that extra kick refinement. The Katjang PINO has been created especially for the great taste moments. The jumbo peanuts have a great deal of space for the spicy coat that is perfectly matched with spices from the vast Asian world on the mixture and also guarantees that will hit your taste buds. The variety of flavours in your mouth can be spread optimally and all perfect blended with the exotic and spicy flavours will flatter your taste buds. If it tastes good, then is right. With KATJANG PINO you are always ready for such a fancy delicious recipe with the finest flavours blended with the full flavour of crunchy jumbo peanuts. Our jumbo peanuts are much healthier and are a great alternative to chips - therefore, take yourself a big portion of our delicious nuts, sit back and relax from everyday stresses and worries and live the moment. Give your taste buds a little wellness. Now is time for the big moment taste!